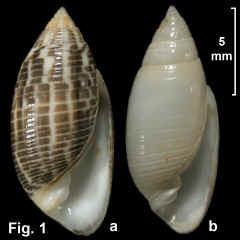 Description: Shell pupoid in shape, variable in width, aperture 2/3 of total shell length. Spire whorls smooth or with a few broad, low spiral cords separated by narrower grooves; suture impressed. Last whorl sculptured with variable number of broad spiral cords, the intervening grooves sometimes with fine axial lamellae. Aperture elongate, increasing from narrow at top to broad and rounded below; outer lip sharp, inner lip with thick white callus on previous whorl. Columella with a strong bifid plait below a single weak plait. Shell covered with brown periostracum when fresh; underlying shell unmarked white (forms nivea and kirki, Fig. 1b), or with black or brown patches on spiral cords, arranged in wavy axial stripes (form fumata, Fig. 1a). Size: Up to 19 mm in length. Distribution: Indo-West Pacific. The Australian Museum collection holds empty shells from the tropics southwards to Sydney. Habitat: Empty shells from beach washup are moderately common in NSW. 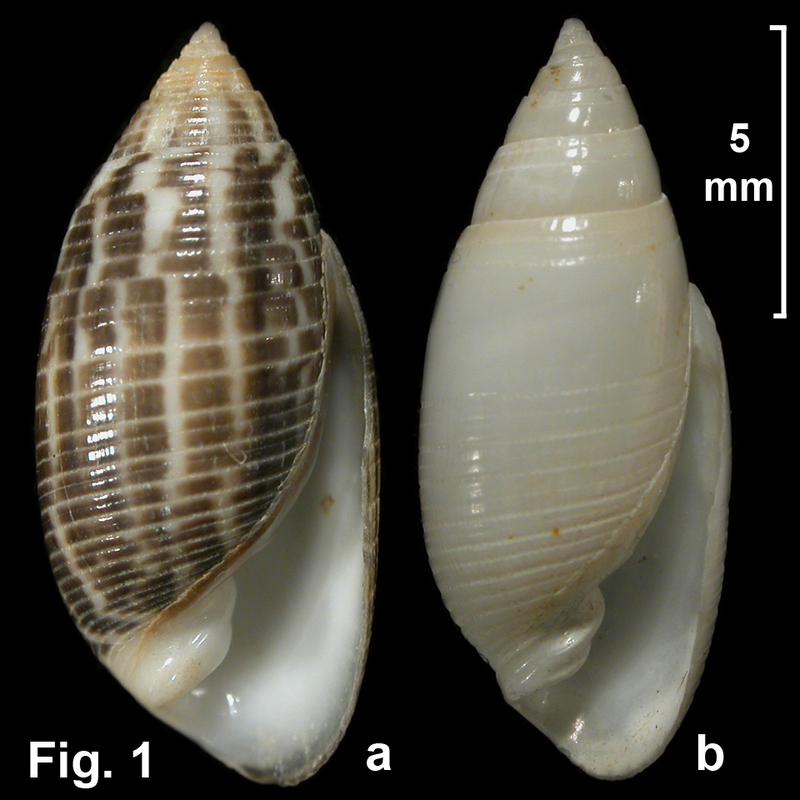 Burn (2015) reported the species living as a common subtidal inhabitant of the estuaries of southern NSW, but shells are hardly seen in beach washup south of Sydney. The Sea Slug Forum at http://www.seaslugforum.net/factsheet/pupakirk gives the habitat in New Zealand as living in silty sand or fine sandy shell gravel subtidally, or sometimes intertidally at extreme low tide. It burrows to a depth of about 15 mm and feeds on sand-dwelling polychaete worms. Synonymy: Beu (2004, p. 218–220) gives a long list of synonyms, which includes Pupa fumata (Reeve, 1865), Pupa nivea (Angas, 1871) and Pupa kirki Hutton, 1873. His synonymy is based only on shells and a future genetic analysis may well result in the restoration of multiple separate species with restricted distributions.